Published: October 2017 - Disney Hyperion. Source: Thank you so much to Penguin Random House SA for sending me this book in exchange for an honest review. My name is Magnus Chase. These days, I'm one of Odin's immortal warriors, but that doesn't stop people trying to kill me all the time. Loki the trickster god is free from his chains. 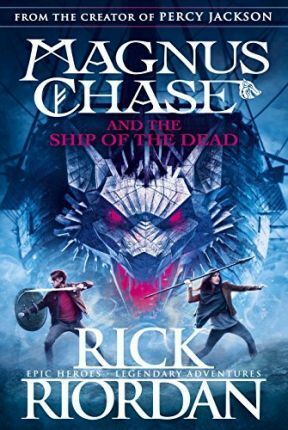 He's put together a crew of giants and zombies to sail Naglfar, the Ship of the Dead, in a battle against the Norse gods. If he succeeds, the final battle of Ragnarok will extinguish all the worlds. With help from Percy Jackson and my cousin Annabeth, and with friends by my side, I have to sail across the oceans to reach Naglfar before Midsummer's Day. The only problems are the angry sea gods, hostile giants and evil fire-breathing dragon in the way. But even if we survive the journey I'll need more than just Jack, my talking sword, to beat Loki. I must find a magical elixir so deadly that it will either make me powerful enough to defeat Loki and put him back in chains for good … or destroy me entirely. I feel terrible about reviewing this book. It's a total "it's not you, it's me" case. Needless to say, while this book wasn't for me, it could very easily be for you! The writing is good. I'm honestly indifferent - it didn't make me fall in love, but there's nothing particularly wrong about it. I also didn't find the humour especially great, and I know the "amazing humour" is something people apparently love Riordan for. The creativity and imagination are astounding. The world is epic, and the fast-paced plot and consistent action keep things entertaining. It's fun. I liked Mallory and Sam, but none of the characters made an impression on me and I didn't feel myself rooting for any of them. I just wasn't invested. And that really sums up my feelings about this book. It was too much Middle Grade, and it was too blah and tame with meh characters. It's not my type of read at all. The Ship of the Dead was my first Riordan novel, and I'm sorry to say it'll be my last. It's not a bad book by any means, but it's not for me. The reasons are completely subjective. Life Update! I'm back.....I think?! Life Update - ft. Indefinite Hiatus!